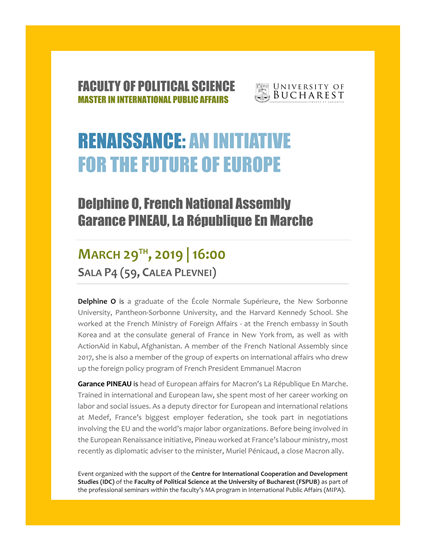 Delphine O is a graduate of the École Normale Supérieure, the New Sorbonne University, Pantheon-Sorbonne University, and the Harvard Kennedy School. She worked at the French Ministry of Foreign Affairs - at the French embassy in South Korea and at the consulate general of France in New York from, as well as with ActionAid in Kabul, Afghanistan. A member of the French National Assembly since 2017, she is also a member of the group of experts on international affairs who drew up the foreign policy program of French President Emmanuel Macron. Garance PINEAU is head of European affairs for Macron’s La République En Marche. Trained in international and European law, she spent most of her career working on labor and social issues. As a deputy director for European and international relations at Medef, France’s biggest employer federation, she took part in negotiations involving the EU and the world’s major labor organizations. Before being involved in the European Renaissance initiative, Pineau worked at France’s labour ministry, most recently as diplomatic adviser to the minister, Muriel Pénicaud, a close Macron ally. The event organized with the support of the Centre for International Cooperation and Development Studies (IDC) of the Faculty of Political Science at the University of Bucharest (FSPUB) as part of the professional seminars within the faculty’s MA program in International Public Affairs (MIPA). It is also open to students of Political Science, as well as International Relations and European Studies, within the limit of available places.